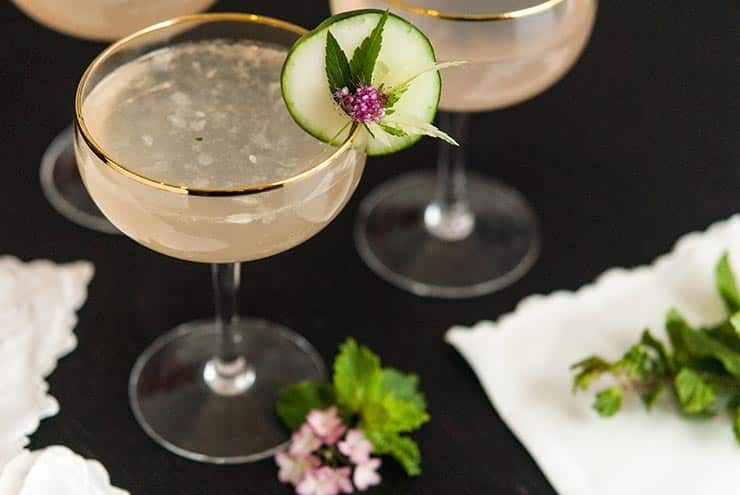 This exquisite sake and pink grapefruit cocktail is shaken with muddled cucumber and mint, splashed with soda and pairs perfectly with summer sunsets and stolen kisses. I’ve been in a romantic kind of mood lately. Taking coconut milk baths to cool me down, listening to a lot of Stan Getz, dreaming of owning lingerie I wish I could afford… and drinking a lot of pink cocktails. 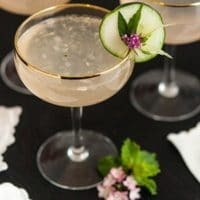 I made these feminine pink gin and tonics recently, and they’re simply lovely, but they’re not quite as romantic as this pink grapefruit cocktail. 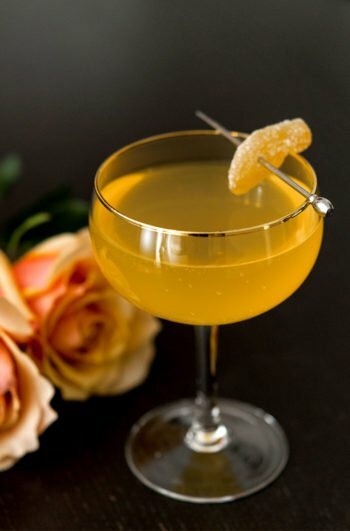 This beauty contains no extra fancy liqueurs or mixers, no obscure tinctures or bitters – simply fresh pink grapefruit juice, sake, muddled cucumber, muddled mint, simple syrup and soda. That’s all there is to it. It’s perfect for a romantic evening on the stoop, a feminine brunch or bridal shower, a sunset cocktail party on the lanai… coconut milk bath party for 1… maybe 2 (?) It’s honestly perfect for just about anything you want to add a little loveliness too! What Kind of Sake Should I Use? I used Gekkeikan Sake for this cocktail. It’s super mellow, not floral, incredibly smooth and very easy to find. If I’m making sake cocktails for large parties, this is my go-to sake because it comes in a nice big bottle, tastes so gentle and is quite affordable. (I also have no affiliation with it, so it’s honestly just my favorite). If you can’t find this sake, you can’t go wrong with another mellow brand, and don’t be afraid to use one that does have floral notes if you want to add a little flowery spell to it. What if I’m Not a Sake Kind of So & So? Don’t fret! I personally love it with sake because it’s so gentle and light and doesn’t add or take anything away from the freshness or brightness of the other ingredients, but if sake doesn’t tickle you, go ahead and substitute a light spirit like gin or vodka, but make sure they’re not flavored. You really want to enjoy the the cucumber, mint and grapefruit ballet without any distracting interruptions. 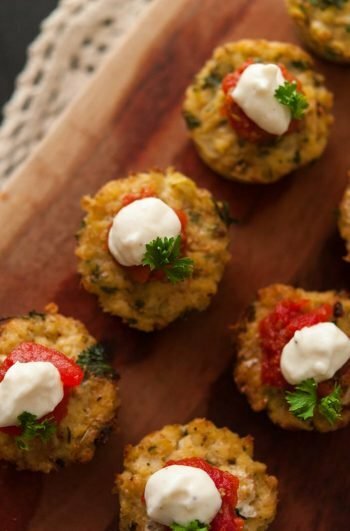 How Do I Make That Garnish!? It’s easy! Find yourself some very tiny flowers in a bodega, then walk around the block and find yourself the prettiest, tiniest little leaves on the prettiest tree. I live in Park Slope, Brooklyn, so luckily for me, there’s lots to choose from! 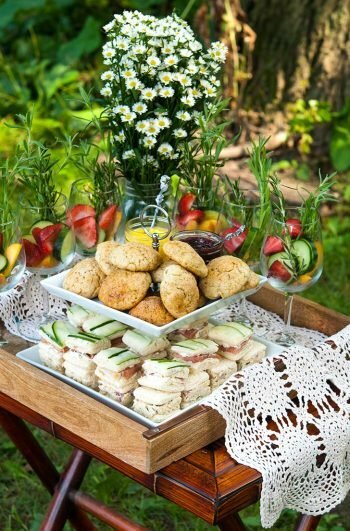 Wash your flowers and leaves, slice your cucumber and make a little slit at the bottom so it sits snuggly on your glass. 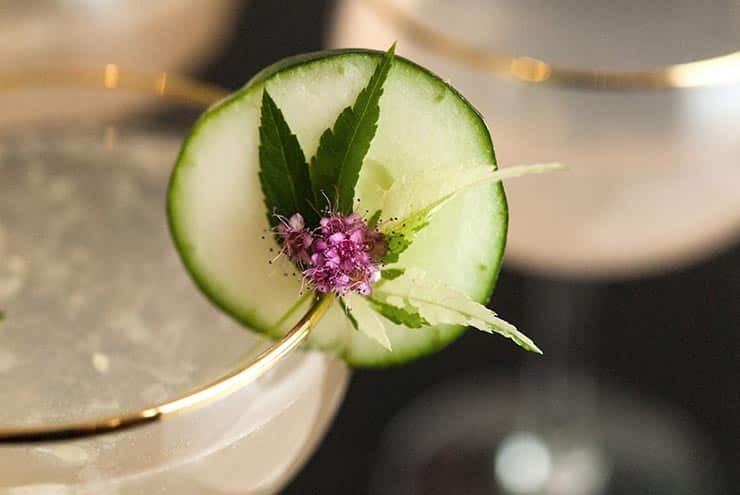 If your leaf is tiny enough, it will stick to the cucumber, and if you leave a bit of the stem on your flower, it will easily rest on the glass. 1. Slice and assemble your cucumber garnish and set it aside. 2. 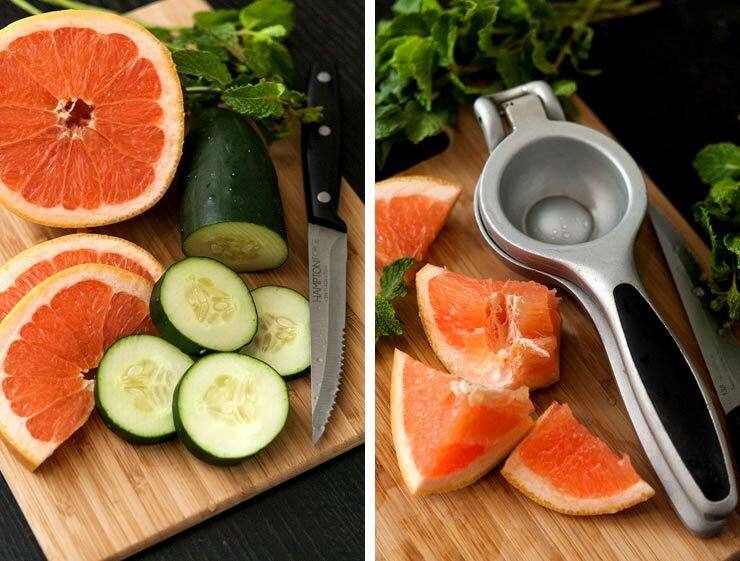 Chop your cucumber for muddling and juice your pink grapefruit so you have 2½ ounces of juice. I just chopped my grapefruit into small pieces and used my lemon juicer. 3. 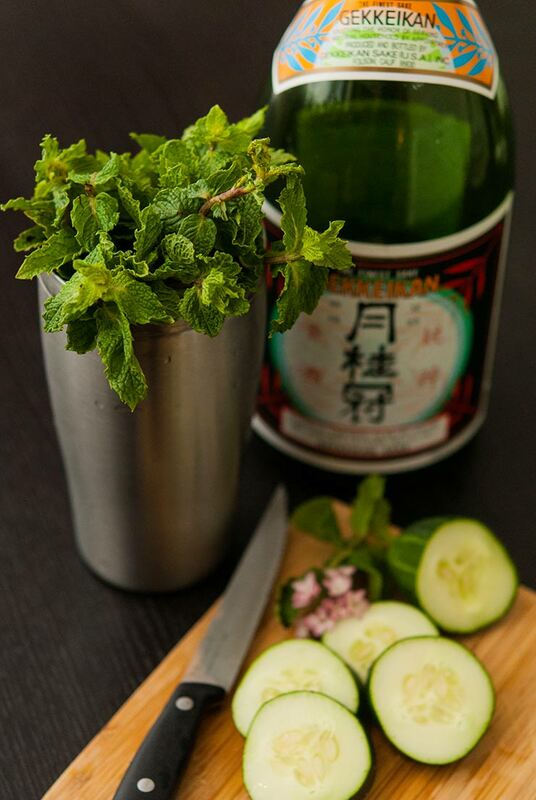 Add 3 or 4 slices of cucumber to your shaker (for 1 or 2 cocktails) with a small bunch of fresh mint and muddle. 4. Add ice to your shaker then add your grapefruit juice, ½ tsp. simple syrup and 2 ounces of sake. 5. Shake vigorously and pour (without straining) into a frosted glass. 6. Splash with soda, garnish and serve. Slice and assemble your cucumber garnish and set it aside. 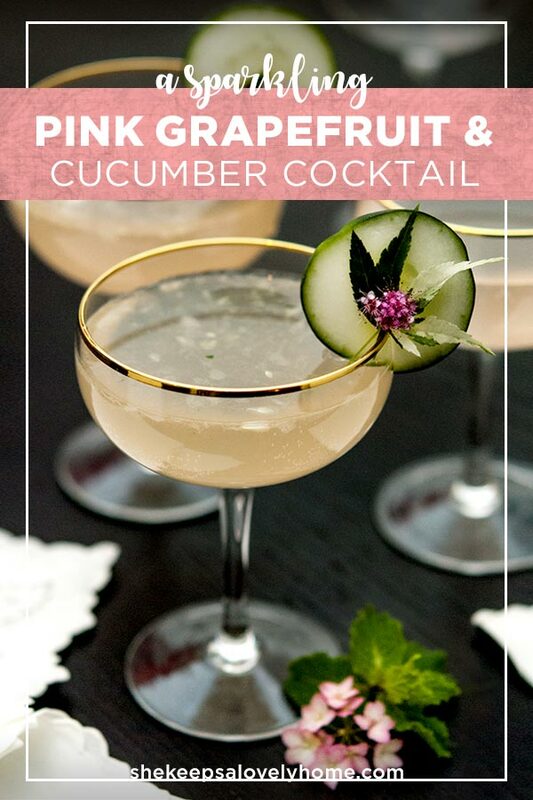 Chop your cucumber for muddling and juice your pink grapefruit so you have 2½ ounces of juice. Add 3 or 4 slices of cucumber to your shaker with a small bunch of fresh mint and muddle. Add ice to your shaker then add your grapefruit juice, ½ tsp. simple syrup and 2 ounces of sake. Shake vigorously and pour (without straining) into a frosted glass. Splash with soda, garnish and serve. Hello. I was just wondering where you got the cute cocktail glasses? Thanks!